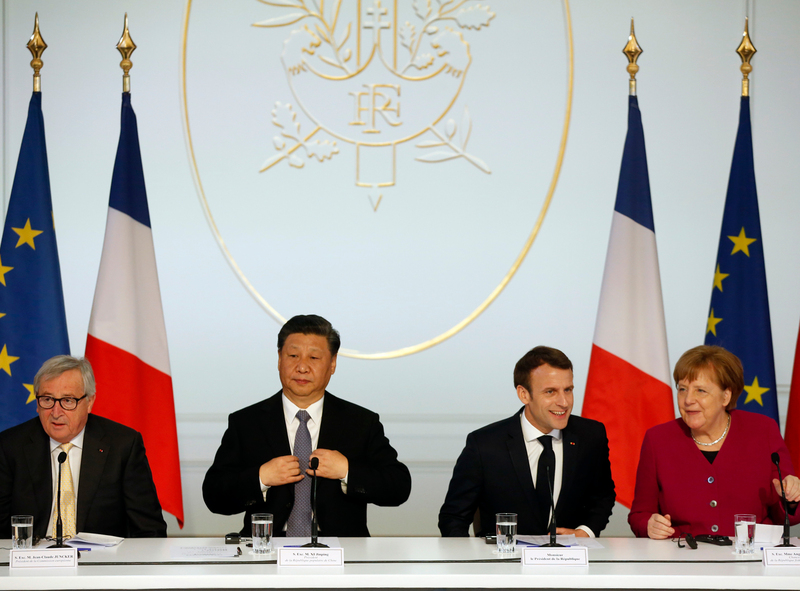 (From left to right) European Commission President Jean-Claude Juncker, Chinese President Xi Jinping, French President Emmanuel Macron, and German Chancellor Angela Merkel at a press conference at the Elysee presidential palace in Paris, March 26, 2019. This Conversation was convened in partnership with Young China Watchers. When Xi Jinping visited Europe in late March, European Commission President Jean-Claude Juncker portrayed the future of EU-China relations in mixed terms: “We are strategic partners, and yes, rivals,” he said, “but competition among us is a good thing.” Indeed, EU member states have been at odds about China for a while, and deteriorating U.S.-China relations are complicating matters. The U.S. is pressuring its European allies to limit the market presence of the Chinese technology giant Huawei, with Secretary of State Mike Pompeo recently visiting Poland, Hungary, and Slovakia to raise the alarm. Italy, which in late March became the first G7 member to join China’s Belt and Road Initiative (BRI), may work with the China-led Asian Infrastructure Investment Bank. Meanwhile, Germany and the UK are forging their own formulas for restrictions and partnerships. What a difference a year makes. At the 2018 EU-China summit, both sides celebrated the 15th anniversary of their “comprehensive strategic partnership,” and lyricized about “fruitful outcomes achieved in politics, economy, trade, culture, people-to-people exchanges.” This year, the summit follows the publication of the harsher “EU-China, a Strategic Outlook,” by the European Commission and the External Action Service. This document characterizes the Chinese party state in a way that leaves little room for a “comprehensive strategic partnership.” It labels China an economic “systemic rival” and a “strategic competitor” whose military build-up “presents security issues for the EU.” The French historian Francois Godement rightly calls the document a “Copernican revolution." The document explains how the EU can compete with China’s high-tech and authoritarian form of capitalism, and how it can counter China's harmful political, economic, technological, and political practices. The 10-point plan published in the document serves as an excellent roadmap for European Commission President Jean-Claude Juncker and European Council President Donald Tusk to follow when they face Chinese Premier Li Keqiang on April 9. Using this template, they should press China to deliver on existing commitments and make it clear that the EU will not wait for China, but will act to protect its interests. Juncker and Tusk should also raise the issue of the two Canadians imprisoned by the Chinese government in retaliation for the arrest of Huawei’s Chief Financial Officer Meng Wanzhou. This will show that Europe not only stands in solidarity with Canada but is against Beijing’s push to normalize hostage-taking. Meanwhile, Germany is taking a step in the right direction with its plan to involve the heads of government from all European Member States in the 2020 EU-China summit. For Germany to seem credible, it must be willing to pay a price. That is why Chancellor Angela Merkel should end Germany’s bilateral consultations with the Chinese government, which brings together the full cabinets from both countries. Otherwise, smaller EU members will continue to call out German and French hypocrisy in pursuing their interests via privileged bilateral channels and for criticizing smaller states when they also try to secure a slice of the "Chinese pie." The Copernican revolution only stands a chance of moving from ideas into action if the most influential EU Member States support unity in Europe. Italy’s March 23 signing of a memorandum of understanding with China was only the latest blow to an already fragile EU position on its relations with the PRC. It is, however, helping to inspire a new conversation around EU-China relations. The recent EU-China Strategic Outlook seems to suggest a drastic if belated shift in perceptions in Brussels, as it defines the PRC as both a partner and a strategic rival. Whether the current disunity within the EU is more the result of internal grievances from some member states, or of China’s influence and soft power strategies, finding a united approach has become more important than ever. It certainly does not help that the EU is getting caught up in U.S.-China tensions and in the protracted trade war between the two nations. Moreover, the U.S. and the EU are already at odds on a number of other issues, including the Iran deal and climate change. China—and how to deal with it—may currently be their most important item of common interest. However, a common position should not be based solely on the perception of Europe as divided between two spheres of interests. Rather, the EU should start putting the EU first —and rethink its approach in terms of its own interests and priorities. Similarly, a more compact, longer-term strategy regarding China need not imply an aggressive posture, but it does imply awareness of the challenges that the Chinese authoritarian model represents for both business and politics. European countries need to demand more from China, especially when Beijing pushes for access to crucial EU markets and technologies while giving too little in return. They must stand firm against violations of international norms, rules, and human rights, and insist on reciprocity. Issues as diverse as technology, BRI-related infrastructure, human rights, climate change, and security cooperation all need to be on table. And the EU needs to do so through in a single strategy. In other words, what the EU needs to better handle China is unity in diversity. A stronger EU will lead to stronger individual members --, and that is most crucial in managing relations with both the US and China in the Trump and Xi era. Many countries in Central and Eastern Europe (CEE) realize that even a close relationship with China will bring them little benefit. Indeed, even though many CEE countries have cordial relationships with China and have signed billions of dollars of MOUs, the economic impact is minimal. A recent report by the Mercator Institute for China Studies, a German think tank, shows how Chinese investment in CEE countries is still negligible when compared to Western Europe, and some states are beginning to realize this. Over the last two years Poland has de-prioritized China. And the Czech Republic, once considered a strong supporter of China, recently blew the whistle on Huawei’s 5G networks and warned against cooperating with the company on developing critical infrastructure. Hundreds of bilateral meetings have demonstrated to CEE countries that spending political capital on trying to improve their relationship with China is inefficient. Even Hungary, one of the largest recipients of Chinese FDI among EU Member States and a dependable ally, received its last significant round of Chinese investment in 2011. The lack of interest when it comes to working with China may even help to explain the passing of recent investment screening measures by the EU. The United States and China have not been able to divide Europe into two camps. However, Italy’s recently joining the Belt and Road Initiative (and likely being disappointed) demonstrates that the main concerns of CEE and South European countries are economic. And some of these concerns are legitimate, such as the impact strict fiscal measures (especially in states that use the Euro) could have on a country's economy, dwindling spending on infrastructure, and less-influential members feeling left out of EU policy decisions. If European leaders put their relationships with China into perspective and address some of the concerns raised by European nations, their foreign policy could become more coordinated. If not, Europe will become even more divided than before. Pundits, think tanks, and EU institutions have decried the Beijing-initiated 16+1 platform, which includes China and 16 countries in Central and Eastern Europe (CEE), for disrupting a united EU position on China. Indeed, some CEE countries that take part in the 16+1 have been more than friendly with China and have blocked some of the more critical EU policy proposals; such is the case with Hungary's position on human rights or on China’s activities in the South China Sea. While this turn of events is problematic, to accuse the entire bloc of facilitating China’s rising influence in Europe is misleading. Several member states outside the 16+1 support China in the EU: Greece and, recently, Italy have both articulated pro-Chinese positions to improve their relationship with Beijing while neglecting the call for EU unity. Moreover, criticizing CEE states for bilaterally engaging China in the 16+1 framework, while older member states like Germany, France, and Italy still enjoy intensive bilateral relations with China, will create rifts in the EU. When discussing the state of affairs with CEE diplomats, one occasionally hears complaints about the hypocrisy of the bigger, more powerful EU members. It is premature, though, to say that China is creating a sphere of influence on the EU’s eastern flank. The CEE member states in the EU recognize the benefits of their EU and NATO memberships. Poland once hoped to be a leader within the 16+1, and it is now keen on going after Chinese spies, with its eye on hosting “Fort Trump." Even Hungary, whose Prime Minister Viktor Orbán is among the most pro-Chinese leaders in the EU, views its ties to China as a bargaining tool when dealing with Brussels and not reflective of genuine admiration for Beijing’s style of government. The EU is a late bloomer in dealing with increasing Chinese influence globally, and it still has a long way to go to craft an effective response that all member states will follow. A good start would be to reconcile the old and new Europe by ensuring that the interests of the less-powerful and newer EU member states are reflected in a united European policy on China. At this EU-China summit, Chinese Premier Li Keqiang will face a more assertive European leadership. The European Commission already set the tone for discussions in its March 12 “EU-China Strategic Outlook.” That document reflects a growing skepticism in Europe about Beijing’s rhetorical commitments to opening its markets and following international rules. It also illustrates how European debates about China have matured. While some European countries still downplay the challenges of the relationship and look at China mostly through the prism of economic opportunity, the EU now more clearly sees the geopolitical and security dimensions of its relationship with Beijing. The EU was unprepared in 2016, when China exploited economic vulnerabilities and fostered division to prevent countries from denouncing its rejection of an international court ruling on the South China Sea. By lobbying the political elites of Europe’s weaker economies and Eurosceptic governments, Beijing convinced Hungary and Greece to water down an EU statement condemning China’s refusal to respect international law in the South China Sea. Since then, the EU has adapted to counter China’s competition and undue influence. For instance, it has adopted an EU-wide investment screening mechanism to protect Europe’s strategic sectors. It is also consolidating European nations’ security requirements for ICT companies involved in the rollout of 5G networks. Some analysts believe U.S. President Donald Trump’s hawkish approach to China has helped Europe find its voice. But rather than echoing American concerns about China, Brussels is developing its own stance. For the EU, China is not only an economic competitor and systemic rival but also a partner on global issues ranging from climate change to safeguarding the Iran nuclear deal. Some European countries, like Italy, feel pressured by the United States to support Washington’s agenda vis-à-vis Beijing. By focusing on which side to take, these countries fail to appreciate that the risks associated with China’s practices are real, regardless of the Sino-U.S. rivalry. Instead, European countries should increase their knowledge of China and independently assess the opportunities and challenges that come from cooperating with Beijing. To further European interests when dealing with China, EU countries must be united and determined. Rome’s pro-China policy shows that perceptions of and knowledge about China vary significantly across Europe, crippling efforts by Brussels, Paris, and Berlin to coordinate European policies towards Beijing. To address these differences, more intra-European debates about China will be necessary. Addressing the EU’s lack of financial support for infrastructure projects, and economic growth—real or perceived—in Europe’s weaker economies is also needed. Lastly, at the upcoming EU-China summit, European leaders should not downplay the assertive tone of the Commission’s “EU-China Strategic Outlook” but follow through on this new and firm rhetoric. Beijing would perceive anything less as a sign of weakness and a lack of resolve. On March 26, the European Commission (EC) issued cybersecurity recommendations to member states for fifth generation (5G) telecommunications networks across the European Union (EU). The proposals did not—as Washington has demanded—call for an outright ban on the Chinese telecom manufacturer Huawei. Instead, they left that decision to individual member states. The EC did, however, request that members complete independent risk assessments of their 5G infrastructure by the end of June 2019 and share information with the European Agency for Cybersecurity to help coordinate an EU-wide approach to security standards in 5G networks. The EU’s reluctance to bar Huawei from building 5G networks on the continent does not mean European governments are unconcerned about the potential risks of using Huawei equipment. Germany recently strengthened security standards for all telecommunications networks in the country and required them to source equipment only from “trustworthy suppliers”—a standard that some German intelligence officials argue Huawei does not meet. Poland went further, moving in January to exclude Huawei from its 5G buildout entirely. But many European countries find that they cannot easily disentangle themselves from Huawei, which offers prices up to 30 percent lower than EU-based competitors and claims to hold 18 5G contracts on the continent already. Germany’s Deutsche Telekom AG warned in January that banning Huawei would delay the rollout of 5G in Europe by at least two years. European politicians also likely fear that by singling out Huawei for scrutiny, they would provoke blowback from China similar to what Canada has encountered since arresting Huawei CFO Meng Wanzhou in December 2018. The European dilemma over Huawei highlights larger difficulties in managing the EU’s economic relationship with China. China is the EU’s second largest trading partner and, according to the Rhodium Group, has deployed $83.6 billion in foreign direct investment over the last three years. As a result, EU countries are careful about risking the economic benefits that come from their relationship with China, especially as Beijing has demonstrated its willingness to retaliate against actions it perceives as threatening its commercial interests. Managing difficult issues in the EU-China relationship will require strengthening intra-EU cooperation; the EC’s cybersecurity recommendations are a positive step in this direction. China’s leaders are adept at keeping regional blocs divided in order to deal with individual countries or select groupings on more favorable terms. They have effectively exploited the divergent interests of Europe’s economic powerhouses and its investment-hungry East and South. To build and project a unified front, the EU must offer a credible economic alternative to Chinese investment. Here again, the example of 5G is instructive, as Nokia and Ericsson lag behind Huawei in their ability to deploy the technology quickly and cheaply. Until Brussels can offer homegrown alternatives to the EU’s smallest members, it will have limited tools with which to pressure China to open its economy and behave more equitably. When considering any individual policy towards China— like trade, or cyber-security, or China’s illegal expansion in the South China Sea—countries should take a holistic approach to all of Beijing’s activities. This includes the systemic human rights violations that occur daily in China, like widespread citizen surveillance and the detention of more than 1 million Muslims in Chinese government concentration camps in Xinjiang. As Italy moves closer to China’s Belt and Road, it risks giving the impression that it tacitly accepts Beijing’s malevolent behavior more broadly. What countries like Italy also appear to be ignoring in striking a closer relationship with China is the possibility that the strategic, rather than commercial, agenda behind Belt and Road gains prominence over time. If Beijing intended Belt and Road to be a means to compete with the United States for global influence and power—including with countries formally embedded within alliances and structures led by the United States—then the relations forged under Belt and Road could quickly take on diplomatic dimensions, and even lead to security links. This evolution of Belt and Road could raise a number of important issues for its member states’ relations with the United States, like export control licensing, Committee on Foreign Investment in the United States (CFIUS) approvals, intelligence sharing and other areas where close alliance relationships have brought countries distinct benefits. We are currently witnessing a pivotal moment in geopolitical posturing. The United States should do more to communicate to European countries, including Italy, the long-term strategic objectives that China is likely using its Belt and Road Initiative (BRI) to advance. The United States and Europe have been slow to respond to China’s global trade agenda. It would be a shame if this tardiness results in countries like Italy taking steps that risk putting them on an ill-considered trajectory. When it comes to trade with China, the U.S. and its allies cannot ignore the range of challenges posed by China, including human rights abuses, North Korea sustainment, military modernization, IP theft and corporate espionage, and China’s aggressive expansion of its sphere of influence in the East and South China Seas, among other provocations. Policy with China cannot be done piece-meal. Furthering trade without addressing human rights and national security risks will only embolden the Chinese government to continue such actions. Europe is caught in the middle of the economic and political tensions between China and the U.S. The EU and China have been economic strategic partners, relying on each other for trade and investment. However, the relationship appears unbalanced, with China creating roadblocks for EU companies while enjoying an open EU market and un-scrutinized technology transfer. Chinese companies have not only thrived in this market but have also started to outpace EU companies in some emerging technologies. In a recent joint communique, the European Commission defined China as a systemic rival, echoing statements from the latest U.S. National Defence Strategy. While the EU has deployed strong language, it has not yet formed an effective China strategy: now is the time to do so. Why is an effective strategy lacking? Because the EU is divided, and its members seem to lack the political will to coordinate their actions. Many Central and Eastern European countries have been marginalized in past EU-China summits—which led to the creation of the 16+1 Cooperation Initiative. And while some see 16+1 as part of a Chinese strategy to ‘divide and rule,’ it actually comes more from existing divisions and a lack of representation of these smaller countries in the EU. Additionally, instead of leading the way in redefining EU-China relations, many of the most powerful EU economies are still doing business as usual with China. Germany and France, two of China’s two largest EU trading partners, have been the most critical of China trade relations. But it seems unlikely they will sacrifice that economic benefit for a common strategy. This has led to a dissonance of talk versus action. Another important factor is the role of the U.S. in EU-China relations. Xi Jinping visited Europe in late March, just before the 70th anniversary of NATO on April 4 – an anniversary that U.S. Vice President Mike Pence marked by calling China’s rise “perhaps the greatest challenge NATO will face in the coming decades.” While the EU’s transatlantic ties remain much stronger than its ties with China, the power of Chinese money and investment could gradually bring EU countries closer to Beijing. To enact an effective strategy, the EU needs to come together: A united EU market can provide the leverage to make China comply with demands for a more balanced economic relationship. In advance of the EU-China summit, Commission President Jean-Claude Juncker stated that “Chinese companies have free access to our markets in Europe, but we don’t to the markets in China.” This sums up the frustration in Europe over economic relations with China. Juncker is a smart politician. But there are a number of analytical problems with this statement. Plenty of foreign companies—including European ones—continue to perform well in the China market, which is more open than Japan or South Korea were at similar stages of development. To be sure, market access varies by sector and there are regulatory hurdles, but in many cases these are being addressed, albeit gradually. More importantly, the focus on regulation obscures the challenge of fiercer competition as the capability, flexibility and innovation of Chinese companies grows. It is this which accounts for much of the difficulties facing foreign companies in China—while on the upside, the growing sophistication of Chinese consumers and corporates opens up many new opportunities for European and other foreign companies. Looking in the other direction, there are hardly any Chinese companies with a substantial presence in European markets. And as recent developments around 5G have shown, when Chinese companies do have a global competitive advantage, there is no guarantee of ‘free access’ either. Indeed, the commanding heights of the global economy remain predominantly in American, European and Japanese hands, in spite of China’s extraordinary economic rise. A small number of Chinese companies are beginning to challenge this, complicating the hierarchies of the global economy. But the head start enjoyed by the West, including Europe, remains substantial. This is the other problem with Juncker’s comment and more generally with the calls for “reciprocity:” a failure to reflect the power relations in the global economy. For Europeans, a more accurate acknowledgement of these factors might make its lobbying more persuasive. There is also a point for the Chinese government here. The substance of Beijing’s positions—including its desire to retain developing country status in the WTO—reflects the reality that China still has a way to go before the overall quality of its economy matches that of the West. But meanwhile, China calls for equal treatment as a major power. Perhaps it shouldn’t therefore be surprised when Europeans and others ask for economic and commercial reciprocity.